it depends on who's doing the talking, or writing the brochure. confusion has already been confounded this past week in discriminating between a t-shirt and a baselayer, though to be honest, in the latter case, it becomes a semantic discussion rather than one that might conceivably end in tears. for, to be deliberately obtuse, when is a jacket, not a jacket? when it's a jacket, of course. there will be those of you who have grasped the iniquity of the occasion in a gearshift. and just as confusingly, there will be others exhibiting not only the quizzical demeanour i once possessed, but determinedly wondering if this is not the website it was supposed to be. it is again, a matter of semantic definition, but where the t-shirt/baselayer argument was not only easily resolved, it was ever easily resolvable in the first place. floors and ceilings if i recall correctly. but jackets are of a differing proposition altogether. the less radical definition is that of an outer shell, one designed most often in cycling terms, to protect the honed athlete from specific elements, depending principally on the time of year. if i'm willing to accept that as an astute interpretation of the genre, we have yet to reach shaky ground. however, taken quite literally, this latter instance would suggest that the selfsame honed athlete was already replete with the baselayer du jour, topped with either a long or short -sleeve jersey of indeterminate thickness. it's a climatic choice, you understand. along with most of you, i already own several that fit the description nicely, but the fly in the oitment, so to speak, arrives when someone proffers a jacket. in this case, the esteemed mr yanto barker, formerly seen aboard a colnago c59, but currently aiding and abetting the second career of magnus backstedt in the uk youth team and now stridently aboard a windymilla bicycle. yanto, who in tandem (not literally) with big maggie, is also seeing the light of a second professional career, returned to the fold initially to test and promote his own marque of cycle clothing under the brand le col. we have crossed paths previously on the occasions of my reviewing several items from the original range, and it was at yanto's request that i clad myself in a gent's b3 winter jacket and a matching pair of winter bibtights, and it's sort of at this point that dictionary definitions began to rear their ugly head. the le col b3 winter jacket has a singular purpose in life, and in order to fulfil that purpose, it's jacketness is one step removed from that of others who may witter on about softshells and hardshells. do not willfully misunderstand me; i have great affinity for the latter, but when performance comes to shove (can i say that? ), they do not possess the sort of jacketness that constitutes a b3 from lecol. here is an italian made garment that, when zipped from the lower zip garage to the upper zip garage bears an uncanny resemblance to having been sprayed on. i will concede that such does prefer the body shape of a whippet with as few inadvertant bulges as possible, but its constitution would be hard to surpass. 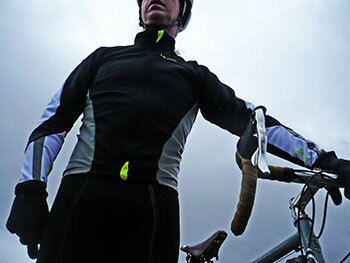 the mix of windproof, waterproof and breathable fabric has been honed to the point of perfection, with a sterling length of sleeve and cuff, the latter provided with thumb loops to negate any draught inducing gaps between sleeve and winter glove. the collar is of exemplary, fleece-lined height, while a substantial proportion of the lower body is clad in a scotchlite reflective material that is, in the face of benign daylight, grey. 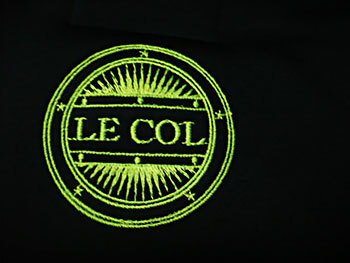 everything appears to be triple-stitched in the manner that all le col clothing has been from day one, while its race-readyness is enhanced by the existence of three rear pockets and a fourth waterproof zipped utility. 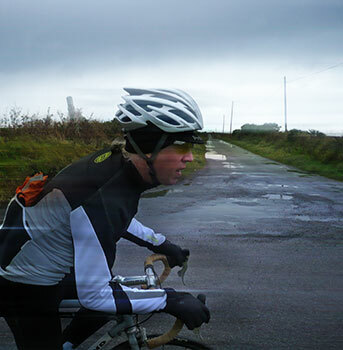 though i have ascribed the epithet race-readyness in its direction, in fact this is formula one status clothing in which the serious cyclist might best continue training throughout the duller, colder, windier and wetter days that lie before us. internally, there is enough fleece to re-clothe a flock of sheep, all the while pared to a minimum that nothing untoward restrict the pelotonese in their quest for winter fitness. not for nothing is mr barker one of the country's finest. his attention to detail and innate knowledge of the cyclist's metier has borne significant fruit in this case. 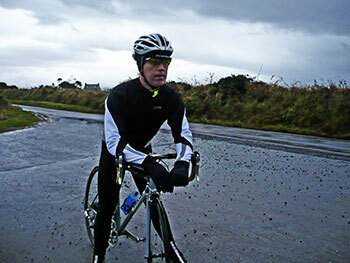 the winter bibtights are no less minimalistic. though there can be no query over their nomenclature in relation to their true purpose in life, they are a particularly adept match for their b3 stablemate. there is evidential clever attention to the panelling, ensuring a close and comfortable fit from bib straps to ankle grips. were it necessary to take exception to any of the forgoing details, it might just be with those ankles. featuring a delta-shaped panel of reflective scotchlite at the back (visible above waterproof overshoes), they are a particularly close fit, one that requires a smidgeon of effort to pull over naked feet, and while there was no discomfort even overlaying a pair of winter socks, i feel i might have wished for a zip closure to ease initial fitting. i am, however, willing to concede that this might advertise me as a bit of a big girl's blouse and thus occlude me from the professional ranks. 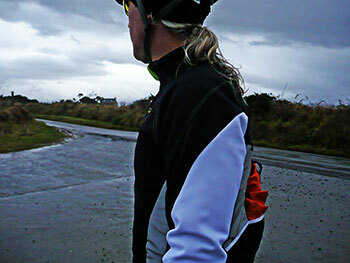 the outer fabric is aqua-zero breathable, waterproof roubaix, providing a high degree of water repellency, which turned out to be something of a godsend when riding a bicycle in the rain, not fitted with mudguards. in keeping with the theme of minimalism, the b3 winter tights are fitted with a very comfortable and resilient pad, meaning no need to wear shorts underneath. stitching is as before, and it's worth pointing out that the waterproofing has seemingly no adverse effect on the flexibility or stretchability in regular use. that pretty much covers what the garments look like, the purpose for which they were intended and how most of it is to be achieved. finding out if they do what it says on the tin was definitely the fun part. 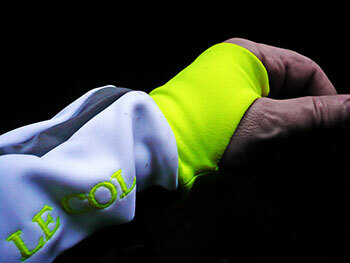 it would be foolish to deny that the le col b3 winter range has speed and souplesse uppermost in its mind, and i think it does me no credit at all that their initial trial of strife was encompassed in the sunday morning, velo club ride. though i have no wish to demean this weekly peloton, its composition, by very definition stretches from wannabees (me, me ,me), to the relaxed pace of the weekend commuter. this may undermine a propensity for speed, but plays to its advertised thermal strengths. in this case, the jacket was not a jacket, but a jacket, giving cover to none other than the long-sleeve merino t-shirt that i had unilaterally promoted to that of baselayer. i had high hopes from the b3, since the temperature was not much above freezing, the wind was thinking about becoming gale-force and the rain was never far away. 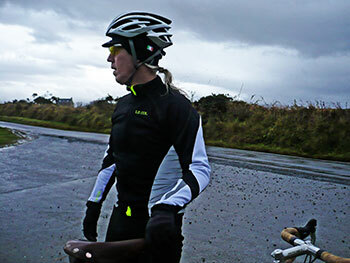 when one of the peloton experienced a puncture not but a few hundred metres from the rspb centre at aoradh, standing around for the better part of fifteen minutes in an exposed location did absolutely nothing to keep my hands warm. a fast slurp up the hill past aoradh farm failed to make great inroads to my digital freeze, but it is to the great credit of the b3 apparel, that the rest of me fared considerably better. 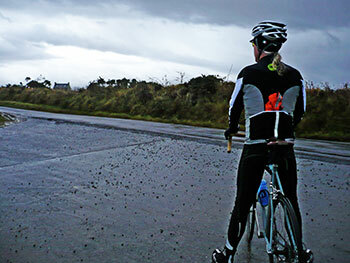 by the time we'd made some headway towards a raging atlantic coast, the rain was straining to break out of the connotations of mere precipitation, and by half-way round, it was no longer funny, and i had good reason to put the fast properties of yanto's clothing to the test. somewhat unsure as to how waterproof was waterproof, i had carried a definably waterproof outer shell in one of those cavernous rear pockets just in case, but on making it back to debbie's after a thorough soaking, the baslelayer/t-shirt demonstrated only sporadic and restricted damp patches on the lower arms. under the circumstances, i'd no cause for recriminations. 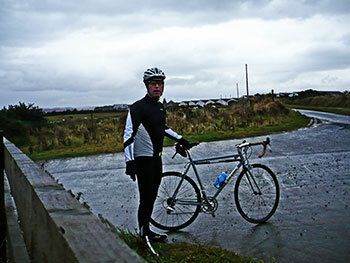 and despite this thorough and prolonged soaking, there was no tenable loss of warmth at any time or at any speed. if you are seriously fast and have the temerity to spend most of the forthcoming winter months attempting to become seriously faster, yanto has made your choice of clothing for the occasion a darned sight simpler than it may have been before. if i were the chaps in san pietro, i'd be getting worried round about now.